Snowplows, ice melt, freezing temps… all of these things can really damage your asphalt if you haven’t prepared it properly. In our widely varying Northern Virginia climate, the biggest problem is the various states of matter that water can assume, depending on the temperature from day to day. To put it clearly: Liquid water can seep into small cracks and holes in your asphalt when the temperature is above freezing. If the temperature dips below freezing, that water will expand as it solidifies, pushing apart the pieces of asphalt and weakening the asphalt. Cracks get wider and turn into holes. Repeat this cycle over and over again all winter and you can understand why spring roads and parking lots are often dotted with potholes. Invest in a professional street cleaning session on a regular basis, but particularly before winter. Make sure any spills or debris are cleared from the parking lot before it snows. That way, when the snow plows come through, they won’t be scraping and dragging damaging objects across your asphalt. Corrosive spills won’t have all winter to damage the sealcoating. And a thorough cleaning and inspection before winter hits will show you where any small cracks or holes need to be repaired now—because if they’re left to freeze and thaw over the winter, they’ll be a lot bigger, deeper and more expensive to repair in the spring. It’s hard to overstate how important these two asphalt maintenance items are to keeping your parking lots looking and functioning great. They protect your investment and save your budget in so many ways. If you discover any cracks or holes, or if the asphalt looks dull, it’s revealing potential future potholes to you. Take this opportunity, if the weather is still reasonable, to call us and schedule a sealcoating and crack filling session to provide good winter water protection to your pavement. Puddles are not a good sign. They can signal low, weak spots in the asphalt and poor drainage. Contact Espina quickly if you see puddles lingering after storms so we can evaluate what needs to be done to even out and smooth the asphalt to keep those puddles from turning into pot holes. By that, we mean to double check references for a good snow removal team that has experience in our area. Get references, just like you would any other contractor. Make sure they have a good history of happy customers and minimal damage. It’s worth it to ensure that excessive scraping doesn’t damage the asphalt. In addition to some snow and ice melt chemicals being hard on the asphalt itself, there are several that are hard on the environment where the melted ice runs off as well. Ask the snow removal teams you interview what sort of chemicals they use, if any, to clear away ice. Mixtures of sand with a little salt, or calcium-based snow-melts tend to go easier on the asphalt and the environment than ammonium-based de-icers. 6. Yes, you can have potholes repaired over the winter! You don’t have to wait until spring! Espina paving makes its own special cold-mix asphalt that is designed especially for sturdy, cold-weather pothole repair. 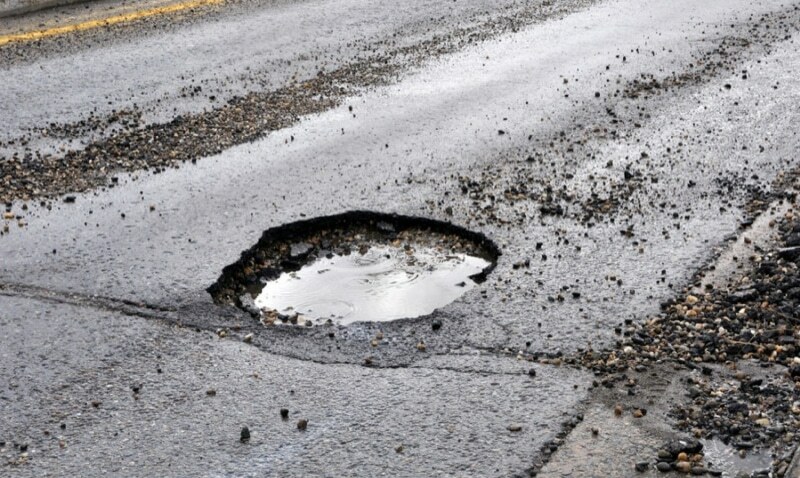 Prompt repair of small potholes can prevent them from becoming large, expensive ones that could damage cars and cause injuries. So don’t wait until spring, call us right away to get those holes fixed fast. If you need to take action to protect your parking lots from winter’s onslaughts, contact us at Espina Paving at (703) 491-9100 today.